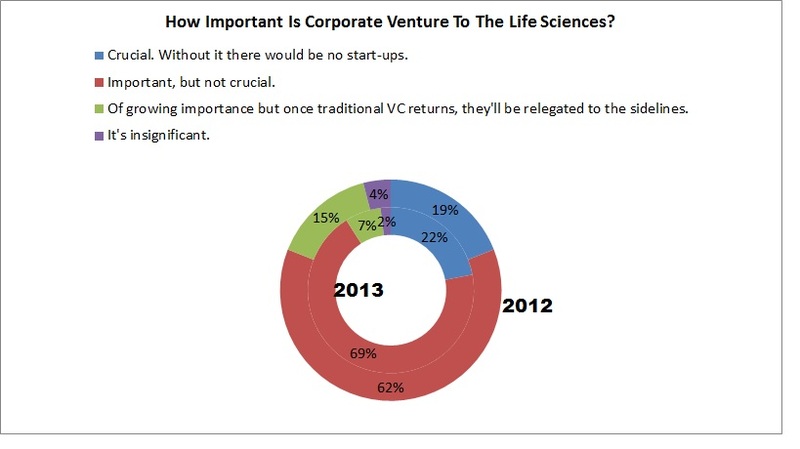 How important is corporate venture capital right now to the life sciences? That’s one of the key questions in this year’s START-UP Life Science VC survey, the results of which will be published in a few weeks. When asked about themselves, corporate VCs mainly said they were important (77%), and the rest (23%) minority said they were crucial. Not exactly unexpected. But traditional life science VCs were right there behind their corporate counterparts. 22% said CVC was crucial and 69% said important. Of the rest, 7% agreed with the statement “It’s of growing importance but will be relegated to the sidelines once traditional VC returns,” and 2% said CVC was insignificant. Corporate investors’ Q ratings are going up at the same time their wallets are opening. According to the National Venture Capital Association and PricewaterhouseCoopers, 18.3% of biotech deals in 2010 and 2011 combined had CVC participation, accounting for 8.0% of biotech venture dollars. The average investment per round was $4.0 million. In 2012, the average investment per round jumped 20%, to $5.0 million, and 19.5% of all biotech deals had CVC participation. The share of CVC dollars was 10.9%. Tack on the first half of 2013, and the last 18 months continue along those lines: corporate venture was involved in 19.2% of all biotech venture deals from the start of 2012 through June 2013, and their dollars accounted for 10.1% of all biotech venture. The average amount of participation per round was $4.9 million. With all the IPO activity this year, we’ll also be able to update another corporate venture story we track closely: the financial returns of start-ups with corporate investors on board. Look for an update of those numbers this fall or early winter. Last time we checked was October 2012, and we found that biotechs with corporate venture backing averaged a 1.6x step-up at IPO, slightly lower than the 1.8x for those without corporate investors. That’s the opposite of what we uncovered for acquisitions: corporate-backed biotechs fare better when selling, with an average 4.3x step-up, compared with those without (3.5x). Is this the reality from now on? As one VC said in the survey comments, “It wasn't all that long ago that corporates were the last folks you'd call to raise money, and you'd only do so if you were desperate or if they were willing to pay up." Retrophin: Martin Shkreli’s fledgling biotech got another injection of capital on August 16 when the company tapped new and existing institutional investors for a $25 million PIPE (private investment in public equity) financing. Retrophin sold approximately 5.6 million shares of common stock and warrants. The company conducted a similar financing in February, issuing 3,333,332 shares of common stock and warrants to purchase an additional 1,530,559 shares of common stock, which resulted in $10 million in proceeds. The new PIPE proceeds will help advance the company’s early-stage pipeline. Proceeds will also help license an autism treatment from an undisclosed major pharmaceutical company. None of the programs in Retrophin’s pipeline have made the advancements the 30-year-old Shkreli has been promising since the company’s inception a few years ago. Tigercat Pharma: The third project in the hands of Velocity Pharmaceutical Development Corp., the CMEA Capital-funded operator of virtual companies, now has a name. Tigercat Pharma was founded last year to study VPD-737, also known as serlopitant, as a treatment for chronic itching, or pruritis. Velocity and partner investor Remeditex Ventures of Dallas have since invested an undisclosed amount in it. A January regulatory filing suggests that Tigercat plans to raise up to $15 million, but at that time it had taken in $500,000 from a single investor. Tigercat licensed serlopitant from Merck & Co. Inc., which previously studied the neurokinin-1 receptor antagonist for overactive bladder. A clinical trial showed that it was no more effective than Pfizer Inc.’s Detrol (tolterodine) in treating the disorder, although it was well-tolerated by patients. Tigercat joins Spitfire Pharma Inc., Corsair Pharma Inc. and an as-yet-unnamed program among Velocity’s projects, funded by Velocity Pharmaceutical Holdings and operated by Velocity Pharmaceutical Development employees. Spitfire has VPD-107 for type 2 diabetes, and Corsair has VPD-380 for a pulmonary indication; neither has been tested in humans. (We’re guessing that the fourth project will also be named for a fighter aircraft, and we’re guessing it won’t be Fokker.) Velocity and Remeditex separately pledged to explore investment opportunities jointly. Regionally-focused Remeditex has confined its investments to Texas and Colorado previously, but expects to broaden its reach with the deal. – P.B.